By Dan Ambrose: Not satisfied with the original diagnosis he received about him needing surgery to repair his ruptured left biceps, former IBF/WBC welterweight champion Andre Berto went and got a second opinion from a different doctor who advised Berto to try rehabilitation for 8-12 weeks rather than surgery, according to RingTV. However, this still doesn’t change the fact that Berto won’t be able to fight Victor Ortiz in a rematch on February 11th and won’t be back in the ring for a long time even under the best case scenario. In the worst case, Berto may have wasted time by not having surgery on his injured bicep and could be faced with needing surgery anyway after 12 weeks. That in turn would make it necessary for Berto to miss an additional 12 weeks following surgery and then we’re talking about a lot of time out of the ring. This is why it’s bad sometimes when patients shop for 2nd and 3rd opinions to hear what they want to hear and end up with a treatment that doesn’t always help them. 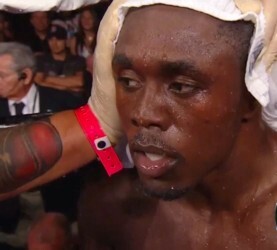 I think Berto should have gotten at least six to eight separate opinions on this injury in case the doctor that advised him not to have surgery turns out to be the only one that believes in this kind of treatment. Berto’s left bicep was torn while training on Monday and it looked bad the way the bicep rolled up after it was ruptured. This is the second time that Berto has torn up left biceps. The first time occurred in his fight with Carlos Quintana. Berto and Ortiz will likely meet up in a rematch in 2012 once Berto sufficiently heals, although he might want to get a tune-up or two under his belt before he faces a tough opponent like Ortiz and ends up rupturing his bicep yet again.